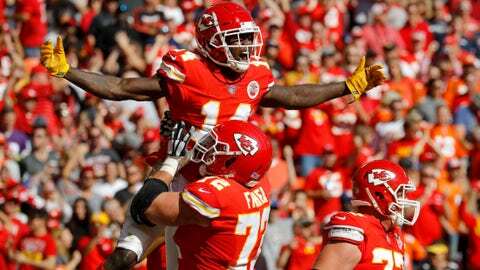 The Kansas City Chiefs' bye week gives receiver Sammy Watkins an opportunity to rest his ailing foot. KANSAS CITY, Mo. — It has been a whirlwind first 11 weeks for the Kansas City Chiefs, filled with record-setting performances, high-scoring losses and the emergence of first-year starter Patrick Mahomes as one of the brightest young quarterbacks in the NFL. It’s also been an exhausting 11 weeks. And a pause is coming at a good time. The Chiefs headed home from Los Angeles on Monday night still feeling the sting of a 54-51 loss to the Rams in what was arguably the most entertaining regular-season game in years. They headed right into their bye week with an opportunity to refocus and get healthy for the stretch run. One that Mahomes and Co. still think will involve a deep playoff run. Indeed, the Chiefs (9-2) aren’t in much worse shape regarding the playoffs after the weekend than they were before it. The Chargers, their closest pursuers in the division, lost to the Broncos, while the Patriots were unable to make up much ground on the No. 1 seed because they were on a bye. After the week off, the Chiefs have two of their final five games against the moribund Raiders, two others are at home against the Ravens and Chargers, and a trip to Seattle rounds out things. In other words, the Chiefs believe they’re well-positioned heading into December. “We’re going to heal up here and get ourselves ready to go,” Chiefs coach Andy Reid said. Wide receiver Sammy Watkins will no doubt use the week off to rest his ailing foot, which kept him out of practice last week and limited him to a couple early snaps against the Rams. Mitch Morse could be back at center after dealing with a concussion for several weeks, and a series of more minor injuries have affected nearly everybody on the roster. But the big question mark, at least in terms of health, revolved around Eric Berry. The five-time Pro Bowl pick still hasn’t been on the practice field, even though he was never put on injured reserve, and time is running out if Berry is going to play at all this season. “If he feels comfortable and the docs are good with it and he’s good with it, then we’ll start easing him in,” Reid said, when asked whether that could happen after the bye. The Chiefs certainly could have used their hard-hitting safety on Monday night. Jared Goff threw for 413 yards and four touchdowns without an interception, and the Rams piled up more than 450 yards in a game that came down to the wire. Most importantly, the Chiefs couldn’t make a stop after taking the lead in the fourth quarter, allowing the Rams a go-ahead answer. Or what kind of team the Chiefs can ultimately become. Both of their losses have come on the road against teams that figure to be in the playoffs; they also lost a shootout in New England, when Tom Brady rallied the Patriots to a go-ahead field goal in the final seconds. And in both cases, the Chiefs would have walked away victors had their defense been able to make one more stop when it counted. So along with getting healthy during their bye week, the Chiefs will no doubt look at tweaking their defense, trying to figure out on the fly how they can improve down the stretch. Health is a good place start. But the Chiefs think there are other issues to iron out. Yes, even the Chiefs’ record-setting offense can smooth over some things. The Chiefs remain one of the NFL’s most-penalized teams, and many of those flags have come on offense. Mahomes also threw three picks and lost two fumbles against the Rams, though that may have been an aberration — he’s been good at protecting the ball all season. There’s work to be done. And the Chiefs finally have a week off to do it.